Yes, I've been absent from the blog again .... life has thrown quite a few problems in our path over the past month and we're finally feeling more back to normal. If normal includes two birthday parties in a week's time, that is. I told Rachel she could have a party before school gets out this year, since hers is in the middle of summer when most people are on vacation. She wanted a Doctor Who theme and she's been planning this for month - literally. This is where Pinterest became my best friend. 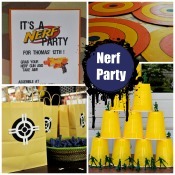 I've been pinning all sorts of party ideas. 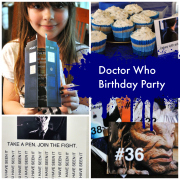 She wanted Tardis invitations. And they had to open like the doors on the ship. I found a good photo of the Tardis and printed it using photo paper. Since the doors open in the middle, I needed to make a gatefold card. The card base is just blue cardstock -- the closest I could get to Tardis blue. If you're going to make a card like this the best advice I can give is to make a practice one, or two if needed using scrap paper. I ended up printing, constructing, then resizing the image a few times before I was satisfied. For the interior of the card I used the interior of the tenth Doctor's Tardis (yes, and the exterior is the 11th's - the blue in that image matched the paper better). Using photoshop I added all the pertinent party details in large white type. And, since the card was custom-made, the envelopes need to be as well. I used a standard envelope template for my Silhouette, resizing it to fit the card. Rachel helped me assemble them. Here's a few Halloween cards for World Cardmaking Day using leftover pieces from this month's DT kit - Echo Park's Chillingsworth Manor and Authentique's Enchanted collection. Both cards get finished off with elements from Echo Park. Before I added the stickers, I deactivated them by pouncing them with the Perfect Crafting Pouch then used foam squares to raise them up. Here's how I did it. I used A6 flat cards as a base and covered them with a light coat of the Best Glue Ever. Then I added my scraps until the base was filled and trimmed the ends. I can't believe it's been a week since I posted. I guess I can partially blame that on the schools who waited until the last week to schedule things - colonial day, class parties, field day.... in addition to recovering from hosting a birthday party. And now that Father's Day is passed and presents & cards have been opened I can share what I made. I started with this pin on Pinterest (the original blog post from Southern Belle Soul, Mountain Bride Heart). Very cool. I thought her collages would be a fun thing to try on paper. Lord knows I have plenty of scraps AND alphabet stickers. Coincidentally I had just picked up a 6x8 pad of Strathmore Windpower mixed media paper. I grabbed the Best Glue Ever, a foam brush and went to work. To glue the paper I used the Best Glue Ever mixed with a tiny bit of water, just to thin it out a bit. It makes it easier to apply with a foam brush on the paper. Once the paper was dry, I grabbed my stash of alpha stickers and some blue paint. I had mixed results with the stickers - a few didn't stick well enough to keep the paint from bleeding underneath. So, to remedy the problem I used a black pen to outline the letters. A little splattering with some red paint and I ready to make the rest of the cards. They're a bit oversized because I didn't cut down the paper, but that's OK because I'm not sending them in the mail. If you want to see more step-by-step photos, check out my post on ScraPerfect's blog. I had some time this week and was able to participate in My Mind's Eye's card challenge. I started with some of the leftover scraps from my designer's challenge layout - and ended up with two cards. I used papers and embellishments from the Miss Caroline collection - "Dilly Dally," except for the die cut tag which is from the "Dolled Up" group. *Love* the patterns and tickets. For the second card I grabbed a few extras My Little Bicycle alphas, although they don't seem to photograph true to their color. Supplies: My Mind's Eye paper from Miss Caroline: "Adventures" Fair, "Best" Vines, "Hello" Flannel, "Curious" Petals; Die cuts: "Adventures" Journal Card, "Best" Title, and "Cute" Title; "Best" Pins & Buttons, red twine, Martha Stewart border punch, Vintage Photo distress ink, My Little Bicycle chipboard alphas, Studio Calico wood alphas. This morning after everyone left I sat down to make a few cards with GCD Studio's new line, Oh Happy Day, by Heidi Sonboul. I used the paper as backgrounds for my cards and cut out pieces of GCD's Splendor "Labels and Tags" to use on top, as well as a few odds and ends from my stash. The paper is bright and cheerful and the Hopefully it'll be a nice surprise when everyone gets back home from school and work tonight. Pink for Rachel, of course. And flowers. For Thomas, some fun stamping. I stamped the chevron with a stamp from Tim Holtz Valentine Silhouette set then dusted it with Perfect Pearls. On top of that a random selection of hearts from Purple Onion Designs. And my final one... more frilly. Hmm, better hide this one from Rachel. She's likely to take it. Supplies: GCD Studios paper: Oh Happy Day - Priscilla, Splendor - Labels & Tags; Stamper's Anonymous - Valentine Silhouette and Letter to Santa; Ranger - Perfect Pearls, Archival Ink, Vintage Photo Distress Ink; Tim Holtz/Sizzix - Love Struck die; Purple Onion Designs - Doodle Hearts; Making Memories - ribbon; Prima - Sculpture Flowers; Jillibean Soup - stick pins; Kaisercraft - paper flower; ScraPerfect Best Glue Ever and Perfect Crafting Pouch; Golden Gesso. ... to everyone. We've got our desserts done, stuffing ready to cook, onions prepped and turkey in the oven. We're packing up to drive over to Burke to share the day with friends. Hope you have a wonderful, pumpkin-pie filled day! Card supplies - My Mind's Eye paper, Martha Stewart paper doily, Cornish Heritage Farms stamp, Ranger Archival Ink, ScraPerfect's Best Glue Ever and Perfect Crafting Pouch. These are old pictures of Rachel - back from her 2nd Halloween. She "helped" me by pulling out M&M packages -- and eating as much as she could. I used Karen's pagemap for the month to put together this layout.